Nicklaus and Watson fought for the title here during the 1977 British Open—but your stay will be infinitely less stressful. Fearless Robert the Bruce may once have ruled this land, but we wonder how brave his heart would have been if he’d had to face down either of the two championship links courses here. After all, this region is the birthplace of golf, and these courses definitely were not designed for the timid. And as if the game of golf weren’t challenging enough, both of Turnberry’s courses were built with breathtaking distractions at every turn. 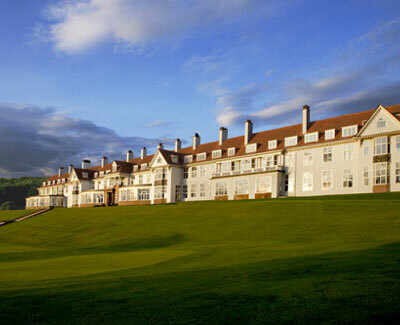 Serious golfers may consider a stay at The Turnberry a sort of pilgrimage to the holy land, but you’ll find so much more than just world-class golf to draw you here. The resort’s 800-acre estate on the rocky Ayrshire coast, with its spine-tingling views across the Irish Sea to the Isle of Arran, is ideally situated for outdoor pursuits such as mountain biking, salmon and trout fishing, horseback riding, and off-road driving. Or you might be drawn to the more pampering pursuits offered by its award-winning spa: hot stone therapy, saunas, and body wraps. Either way, you’ll eventually want to relax in the Turnberry Restaurant to dine on wild salmon or Scotch beef, or visit The Whiskey Bar for a cigar and a mellow single malt. And after all that refreshing seaside air, you'll be more than happy to retire to one of Turnberry's newly renovated guest rooms with its soft linens, fresh and contemporary furnishings, honeyed hardwood flooring, and generous picture windows offering evocative views of the fabled golf course and mystical Scottish coastline.